Global Internation School(CBSE), Nashik has advertised in THE LOKMAT newspaper for recruitment of Teachers,Admin staff jobs vacancies. Interested and eligible job aspirants are requested to walk-in 14/04/18 & 15/04/18.Check out further more details below. 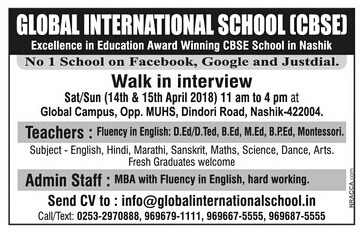 Name of the School: Global International School, Nashik. About School: Today Global International School Celebrated “Mahatma Jyotirao Phule” Jayanti. During the assembly, student (Miss Aakansha Khandave) of Grade 6th given speech on Mahatma Phule. Jyotirao Phule (11 April 1827 – 28 November 1890) was an Indian social activist, a thinker and a writer from Maharashtra. He and his wife, Savitribai Phule were pioneers of women's education in India. The couples were among the first native Indians to open a school for girls in India in 1st January 1848. (b) Admin Staff: MBA with fluency in english,hard working. Address: Global campus,opp.MUHS, Dindori Rd, Nashik.